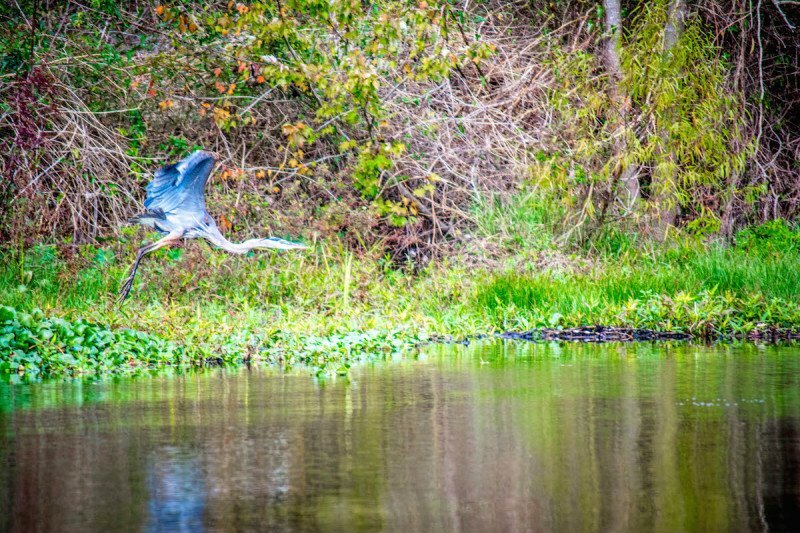 The spicy, cajun filled state of Louisiana has a lot to explore, especially if you’re looking for things to do in New Orleans. Taking the time to spend a week here was certainly on my bucket list of things to do during my adventures exploring the United States. After catching a cab out of the New Orleans airport, I made my way to downtown Bourbon Street where I checked into my room at the Maison Dupuy Hotel and began planning my adventures seeing what this city had to offer. 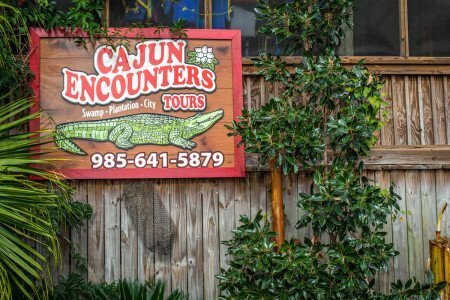 Before too long, I contacted Cajun Encounters Tours and got a first hand experience of a swamp tour through the Louisiana Bayou. 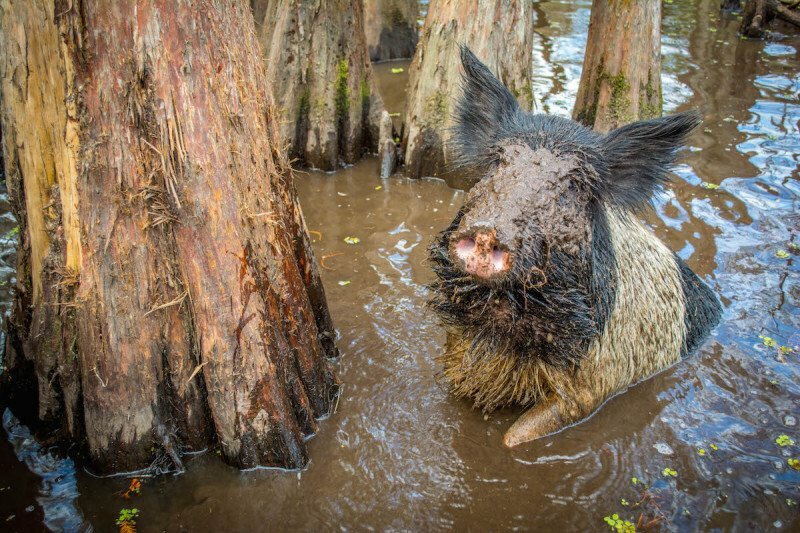 Of course I may be downplaying this a bit, but if you’re wanting to explore the countryside of New Orleans culture, there’s no better place to start than where it all began: in the swamp! 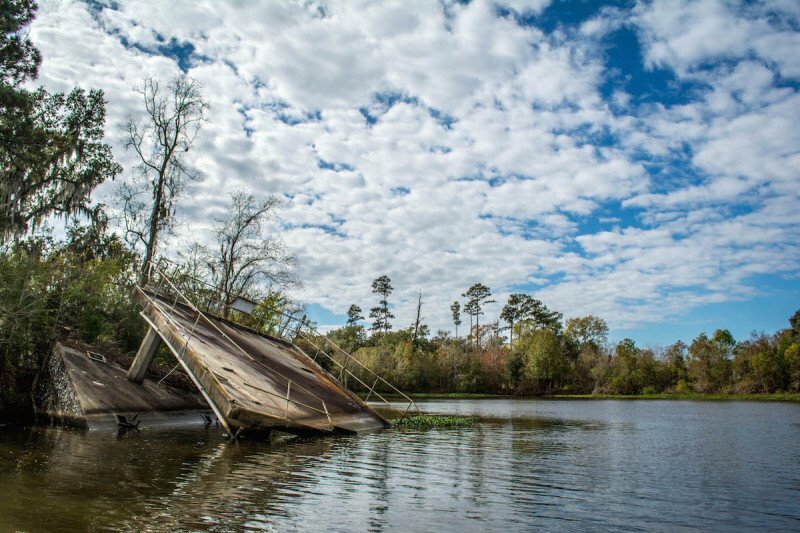 Amongst the many things to do in New Orleans, you must take a cajun swamp tour adventure. The experience is like no other – you begin the transit outside of the downtown district and head away from Bourbon Street towards the bayou. 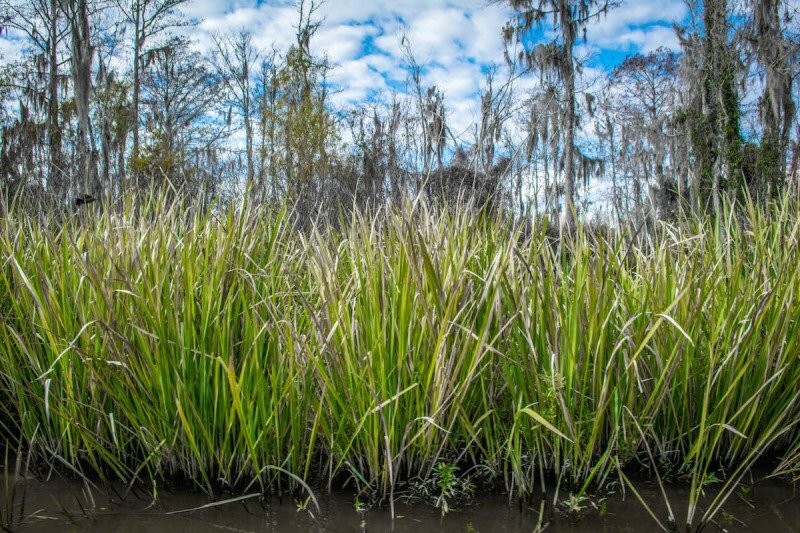 As we began our tour down the river, it was quite relevant that life out here in the bayou is much different from the city of New Orleans. Wildlife was certainly more prevalent as we passed by; the boats rumbling motor spooking a variety of different birds causing ducks, cranes, & hawks to take flight in the air. Meanwhile, below the water line snapping turtles and alligators lay dormant to the cool winter temperatures. Providing information about both the local economy and the surrounding habitat, our guide brought us by historic platforms that were once oil rigs. 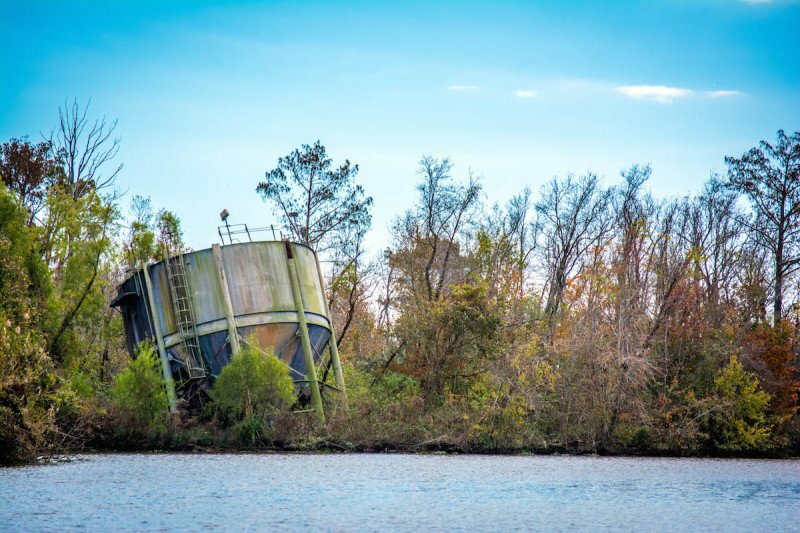 These abandoned rigs laid toppled over and half submerged as they slowly sank in the swamp muck. It was evident that after years of natural disasters such as hurricanes, they proved too much of a hassle for local authorities to pull out of the water and collect for salvage. Continuing the journey downriver, the boat slowed down as we came up to a couple of floating 1 gallon jugs in the water. 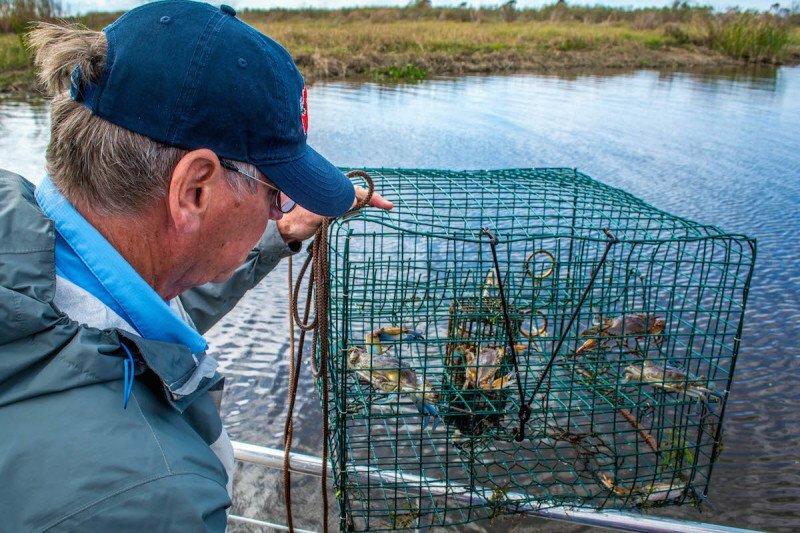 Our guide picked one up to find a rope submerged and, pulling at the length of the rope, there was a crab trap attached to it with a few crabs and some raw chicken inside (the bait). 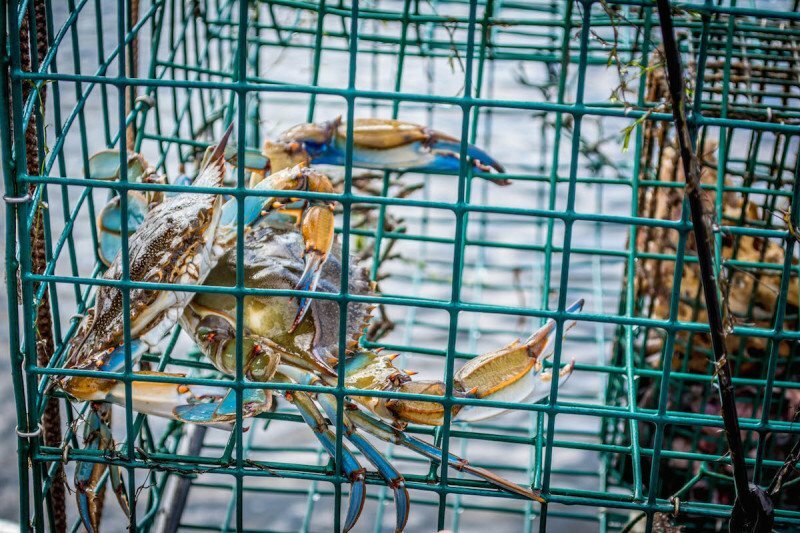 The local fishermen in the area use this method to capture crabs and sell at the local fishery. 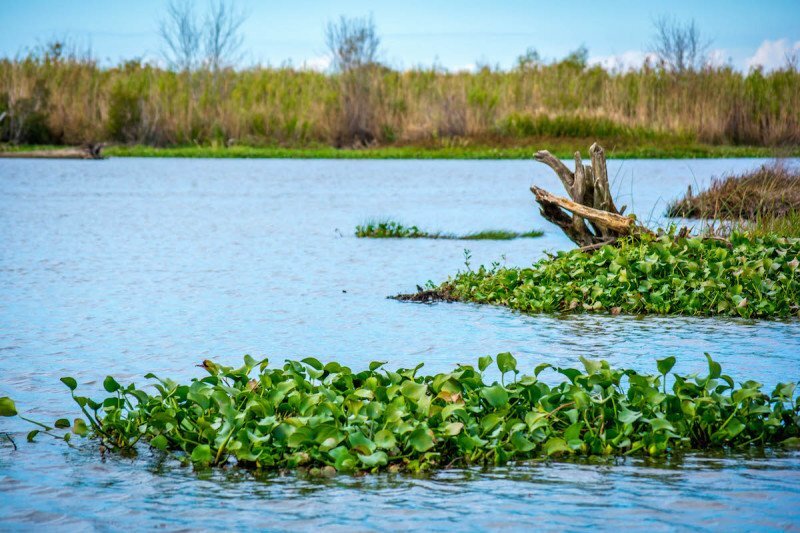 This is something that has been done for years in this area and is even very popular in certain regions of South Florida – particularly in the Everglades. 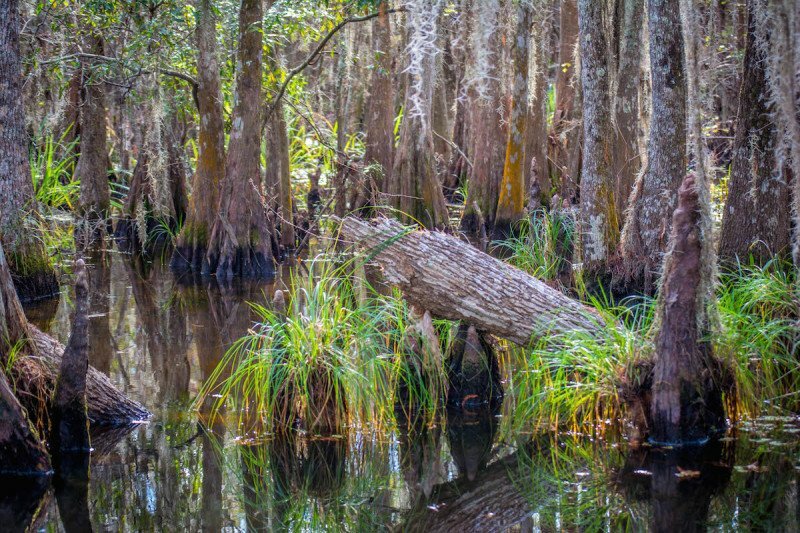 As we continued our adventure through the swamp, the tour guide swiveled the boat through some very tight spaces successfully giving us a first-hand experience of what it was like to come across the picturesque Cypress trees and hanging moss the deep south is known for. 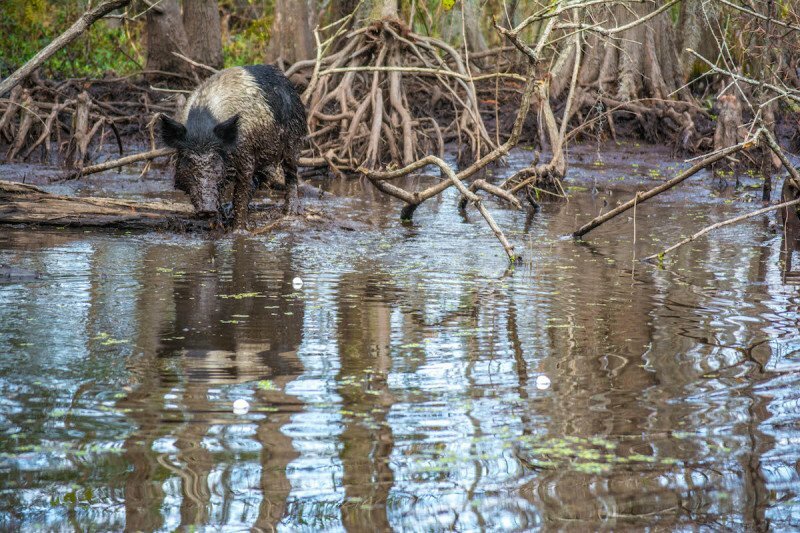 We were even lucky enough to find one of the wild hogs that frequent the tours just as much as travelers passing through do. Whipping out a bag of marshmallows, the guide through a small handful into the water and we watched as the once domesticated hog swam up to the boat for it’s sugary treat. All in all, the tour was quite enjoyable. If I were to do it again, I’d probably choose a bit of a warmer day as to increase the chances of confronting an Alligator like I did swimming down the river in the Ocala National Forest of Florida. But obviously I had a fantastic time and the weather is certainly not something I’ll be able to control anytime soon! 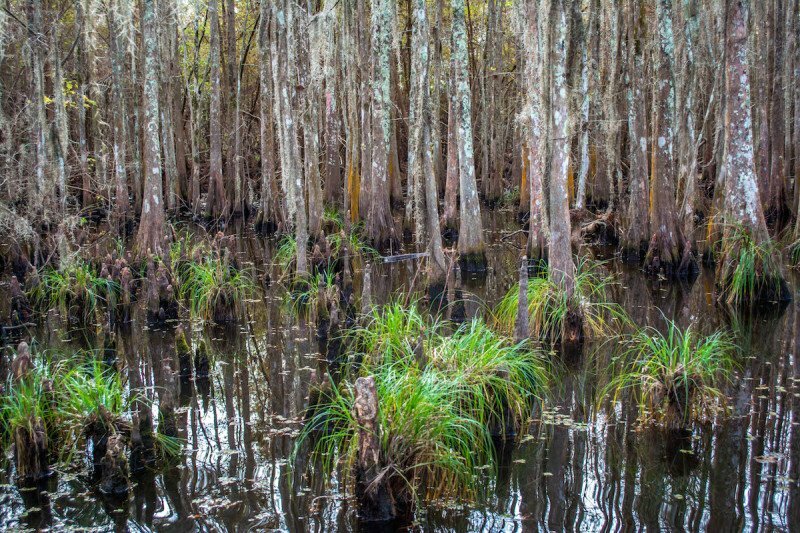 Have you ever toured anything like the swamp of New Orleans’ Louisiana Bayou?